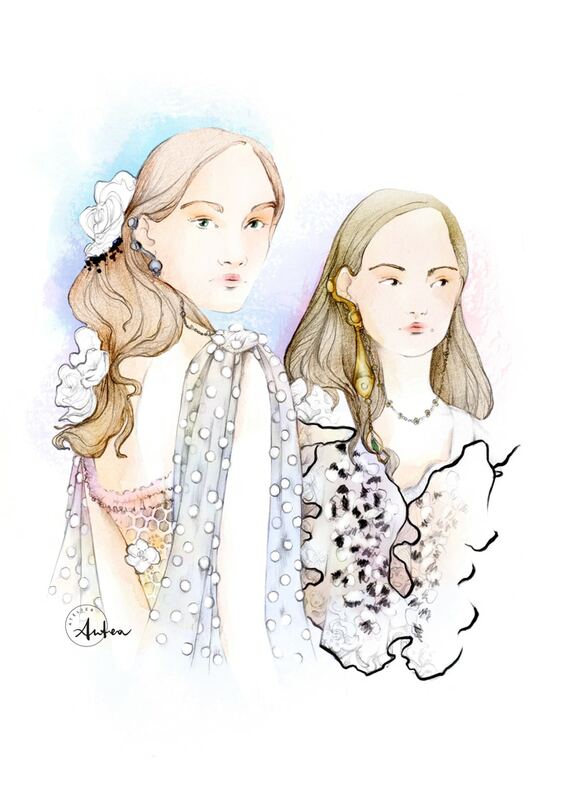 A new illustration for my fashion week moment series. I sincerely hope that you like it. Even if we are talking about the Spring/Summer season, I think that the delicate colors and the lovely play of transparences add a touch of Winter to the Rodarte’s collection. Furthermore there’s something primitive in it that catches my eyes. Maybe it could be for the plumes, or that note of rock… Oh, and regarding the plumes, what about the hair accessories? If the last year I lose my mind with the lovely orchid jewelry, this time I can’t stop admiring the hair clips made of plumes and fabric. Those embellishment are simply amazing, I would like very much to have a couple of them to show off. Don’t you?